Aristotle was the creator of formal logic, with its syllogistic form and show of conclusiveness. It was a great discovery, and by itself would have been enough to make the reputation of a lesser man. 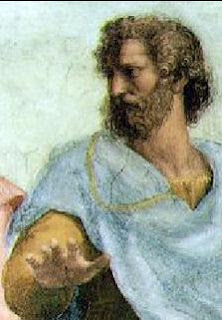 Aristotle applied his discovery to the theory of science, choosing as examples the mathematical subjects and especially geometry, which had already passed from its early tentative stage, in which perhaps Thales was trying to rationalize the empirical rules of land-surveying, to a later more completely deductive form. But syllogistic logic is useless for experimental science, where discovery, and not formal proof from accepted premises, is the main object sought. To start from the premise that an element cannot be broken up into simpler bodies would have led to a correct list of known elements in 1890, but by 1920 it would have excluded all those that are radio-active. Thus the premise has been modified, and the word "element" has changed its meaning. But that fact does not destroy its utility, nor does it invalidate modern physics. Fortunately modern experimenters have not troubled about the formal rules of logic; but the prestige of Aristotle's work did much to turn Greek and Mediaeval science into a search for absolutely certain premises and into the premature use of deductive methods. The results were the assignment of infallibility to many very fallible authorities and much false reasoning in deceptive logical form. - A History of Science and Its Relations with Philosophy and Religion, W.C. Dampier, 4th Ed. Is there anything less true than that statement? Obviously, experimenters often depend upon logic to come up with indirect confirmation or disconfirmation. If the laws of conservation of energy are correct, and if radium gives off considerable energy for thousands of years, then radium must have a a great deal of energy with which it begins. If conservation laws apparently aren't upheld in beta decay, then there must be a non- or only weakly-interacting particle given off--thus the neutrino was predicted. Yes, even when the logic seems good, experimentation is required. But if we couldn't use formal logic to make hypotheses and theories, not much science would be done. One could quibble with what I wrote--is it formal or informal logic used by today's science? The answer is, of course, both. Informal logic most commonly, but more careful--and indeed, formal--evaluations of hypotheses and of experimental results would at least be judged against formal logic in many cases. Naturally, an individual needn't use formal logic to do science at all. The point is that all parts of science are subject to checking, and that includes checking one's informal and/or formal logic. And how does one check any questionable logic? One appeals to formal logic to do so.